Another quick card just in time to enter the CASology challenge for this week with the cue word ‘Pet’. Now, I have to be honest, this was supposed to be a one layer card, but it turns out that I cannot draw to save my life. I wanted to draw a door. A door – that should be easy enough, right? Not if you are me! I ended up having to use my Silhouette to cut a door shape from white card and then use foam squares to get the dimension I needed. The dog stamp was a single from Hobbycraft which I stamped in Memento Tuxedo Black then shaded with Spectrum Noir pens. I then had to fussy cut the image to place it in front of the door shape. The sentiment was printed. I hope the layering isn’t too much for a CAS card – I really must practice my basic drawing skills! Please leave a comment and let me know what you think, Cx. The white on white layering keeps it from being too busy and keeps it CAS. I love it! Such a fun design and great coloring on your pooch! Thanks for playing along with CASology this week! Hey Christine! I think your card is so adorable. I love how the dog is at the door waiting patiently. So cool. Nicely done. Cool layered door, still CAS since it is considered white space. Adorable dog, too…what a sweet card! Thanks for joining us at CASology! I don’t own a dog, but this, I imagine, is the best part – a puppy SO happy to see you when you walk in the door at the end of the day! So glad you joined us at CASology this week! 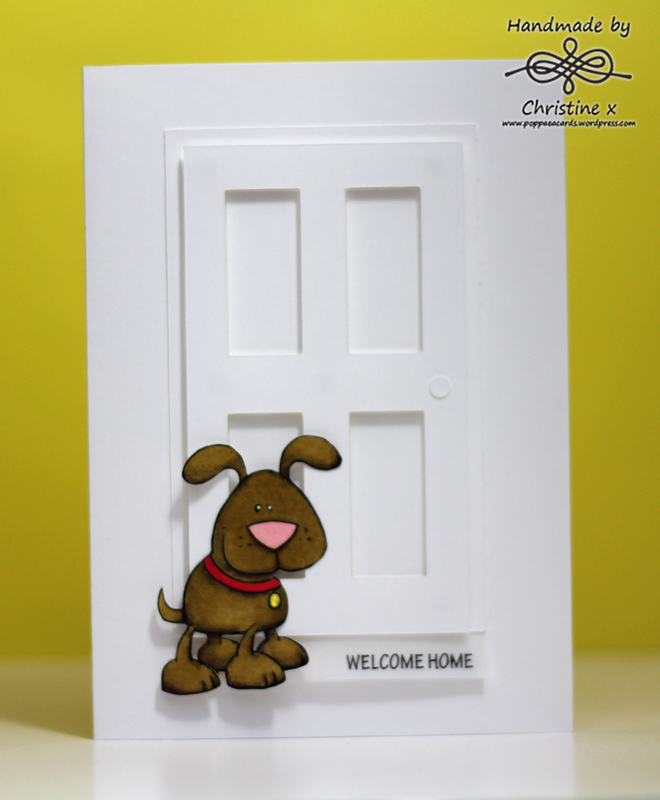 Your silhouette door is uber funky, loving the white on white with that little pop of puppy!